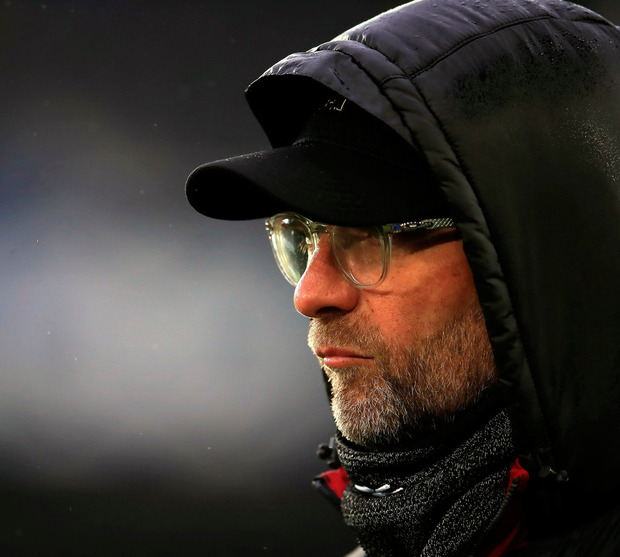 Jurgen Klopp says Liverpool are primed for what promises to be one of the most thrilling Premier League climaxes in history but will not "go nuts" in their efforts to secure the prize. The German insisted that desperation to end a 29-year wait for the championship would not have an impact on strategy and performance, vowing to stand by the principles that have brought his team so far this season. "The target is to win the game - not to go nuts in the game," said Klopp. "The way we did it brought us where we are, and if someone thinks we should now be 10 points ahead of Manchester City, I can't help this person. "We are not in a bad position. Let's do what brought us here, plus more intensity, if possible. With a positive atmosphere around us, let's try it and not be this little, weak flower. "We are in a position that I don't think a lot of people expected with nine games to go. Let's be positive, be lively, be on the front foot, be a real threat, use your power, all your skills, and then we will see." Klopp came in for mild criticism after goalless draws against Manchester United and Everton, the suggestion being that he could have been more adventurous chasing a winning goal in the final stages. Naby Keita was left on the bench in both games, and Xherdan Shaqiri has also featured less over the past six weeks. Klopp suggested the analysis of his side's performances came into the category of 'try it, if it doesn't work, let's try another way'. "That's not how I understand the game," he said. "That is not how it works. That is why I was a bit disappointed in the last press conference because we don't play PlayStation. It is all a sign of being desperate. "We're creating much more than last season. In the last few games, we didn't score as often, but 10 days ago, we played against Watford and were flying. "Then we have a draw, and we talk again about finishing. It's all about realising what kind of situation you're in and using it, not thinking how it was weeks ago. "It is about what is needed individually for the next opponent. We don't stick to one formation or the other. "I can remember when we played 4-4-1-1 and it was really good in the beginning, then people started talking about not winning the games in the manner they wanted us to win. There is always a reason to talk." Klopp said there were reasons Keita and Shaqiri had played less. "Naby is actually in a good moment and has trained well. It's only been the last three games he didn't play too much," he said. "If we play the system we play, most of the time then there are only three positions [in midfield]. Somebody has to be out, but it's all good. They are all fit, and we can use them all. "Shaq had a little injury, and was out. There was something with his back, he needed a little time. He's fully fit now." At the start of the season, Klopp's hope was for Liverpool to still have a title chance at this point. Despite recent draws, he thinks his squad are conditioned to be at their best from here on in. "It looks as positive as it has been since I don't know when," he said. "People are coming back. We had to go through situations with two centre-halves, one centre-half plus Fabinho. In midfield, there were three players left. "To cope and deal with all of the situations in the season - that is the art. If you do that, you are in a situation that pretty much all the other teams want to be. "If there is a chance for us with winning all our games, getting as many points as possible, then we will be there. If there is a final match day and we go for it, wonderful. But we have nine matches, and the one to play now is Burnley." Klopp is hoping to have Alex Oxlade-Chamberlain available for the run-in even though the former Arsenal player's return to competitive action after 11 months out with a knee injury ended prematurely yesterday. The England international was scheduled to play 45 minutes in the U-23 match at Derby but was taken off four minutes before half-time as a precaution. Oxlade-Chamberlain had been holding his right hamstring a few minutes earlier and it is understood that Liverpool were not prepared to take any risks on his return from the serious knee ligament damage he sustained last April. The 25-year-old had shown some nice touches during the time he was on the pitch. However, it was very much a case of him feeling his way back in and there was little in the way of his trademark driving runs from midfield. After the 3-1 victory Liverpool's U-23s coach Neil Critchley said: "Alex obviously had a bit of an issue but hopefully it is nothing major. The bonus for him is that it is not his knee - he is delighted there are no problems with that.